A close first quarter was followed by a one-sided second and third quarter which helped propel the Burroughs High boys’ basketball team to a 68-52 defeat of host Hoover in a Pacific League contest on Friday night. Senior guard Steven Hubbell set the tone early as he tossed in five three-pointers en route to a team-best 17 points. Hubbell, an accomplished football player who quarterbacked the Indians deep into the CIF Southern Section Southeast Division playoffs, made three-point shots in each quarter. 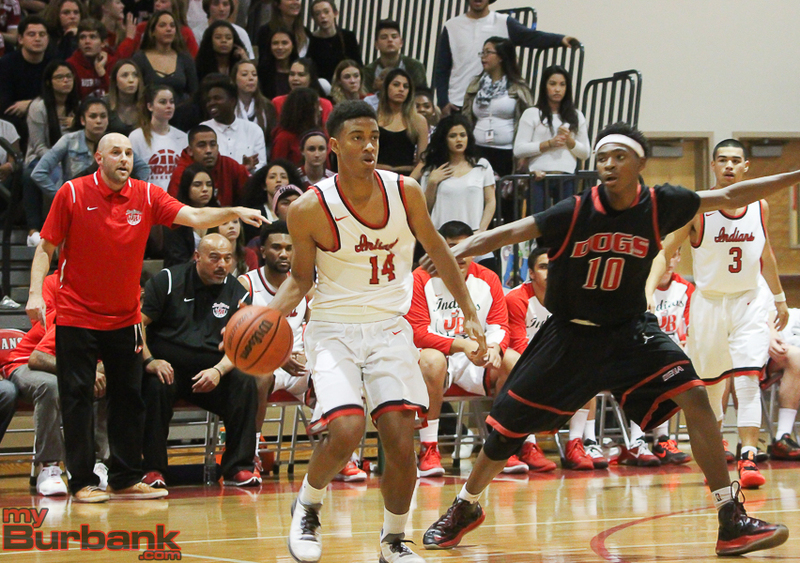 The only other Burroughs player to reach double digits was senior wing Nick Howard who had 10 points. Howard, who had eight points across the second half, also drilled a three-pointer in the third quarter when he scored six points. Hoover guard Alec Pirijanian was the game’s leading scorer with 32 points (24 points in the second half) as he finished with eight from three-point range. The Indians, who shot 40.9 percent from the floor (25 of 61), pulled ahead 11-9 after the first quarter. In the frame, Lee III, a senior who scored nine points, accounted for six while Hubbell scored five points and also drained a three-point attempt. The Indians (13-4 and 3-2 in league) made five of 15 from the field in the opening quarter, but then hit seven of 16 in the second quarter and outscored the Tornadoes 18-8. Seven players scored in the second quarter with junior wing Justin Henderson tallying four of his nine points, while senior guard Eric Allen tossed in four of his six points. Holding a 29-17 advantage at the half, the Indians, who were coming off a road loss to Muir 61-50, then made nine of 15 shots in the third quarter and took a 51-29 lead into the final quarter. At this point Howard and Hubbell showed the way with six points each while Henderson and senior forward Angelo Solis (seven points) each added four points. Solis said he didn’t want to look too far ahead to next week’s game versus Burbank even though it always big. “Of course we always look forward to that game. But we can’t think too much about that,” he said. A slam dunk by junior forward Tristen Hull (four points, five rebounds and three assists) with 1:25 left in the third quarter made it 51-24. Burroughs was outscored by the Tornadoes (4-13 and 1-4 in league) in the fourth quarter 23-17 after making four of 15 from the field with nine players scoring including Hubbell’s trey. 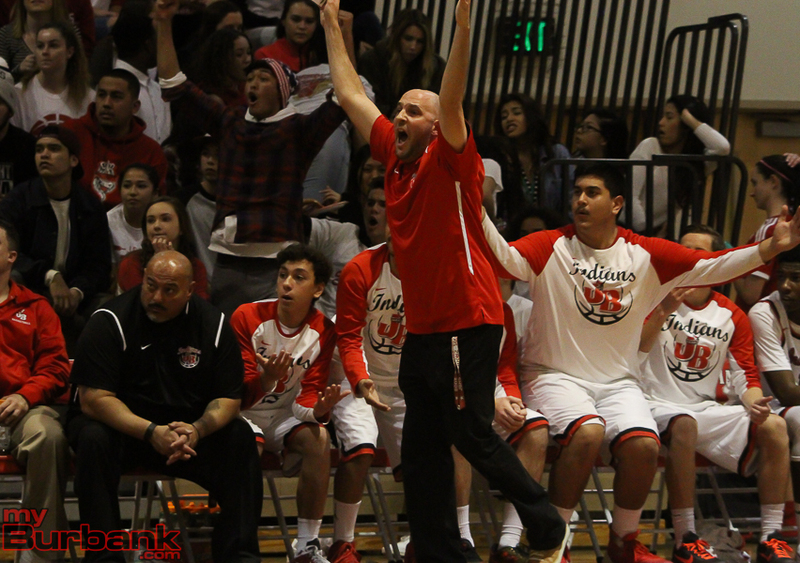 When Solis put in a baby slam with 2:35 left on the clock in the final quarter the Indians forged a 61-42 advantage. Pirijanian scored 10 points in the third quarter and converted two from three-point range. The sharp-shooter then tallied 14 points in the fourth quarter while making four three-pointers. His three-pointer with 3:51 left on the clock in the fourth quarter cut the Indians’ lead to 57-42 which promoted Hochberg to ask for a time out. Burroughs will next host Glendale on Tuesday with a 5:00 p.m. start before traveling to Burbank for the annual city showdown on Friday. 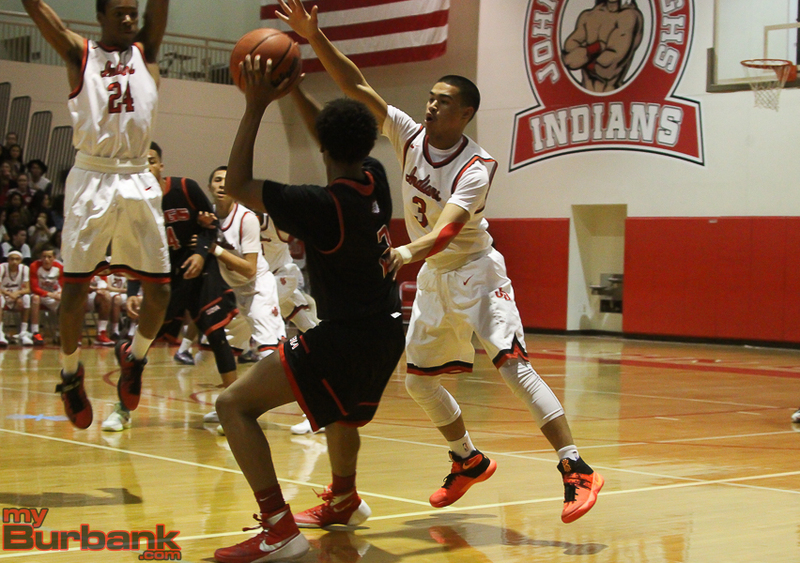 This entry was posted in Boys Basketball, Sports and tagged boys basketball, Burroughs on January 16, 2016 by Rick Assad.